This weekend Captain Drew authorized his web crew to begin accepting pre-orders for the shirts for the 9th Annual PiratePalooza™ Pubcrawl & Pubsing! Pre-orders proved so successful last year that the Captain has decreed that very few additional shirts will be ordered for walk-up sales, so if you want one be sure to pre-order this week. You have until the end of the month of August to order your shirts 2013 PiratePaloozaGear™ [http://www.piratepalooza.com/gear] – don’t miss out! 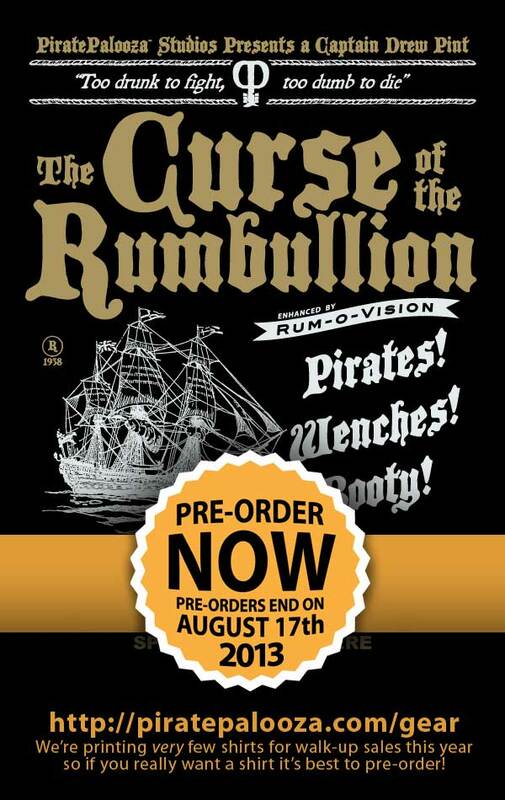 Just like last year, your pre-orders will be available for pickup at the final stop of PiratePalooza™. If you require shipping please use the contact link and we’ll create a special order for you based on quantity and destination. Please be sure to tell your pirate friends and please share this link on your favorite social media site!